You can purchase the paired literature guides for Face Bug and Lester's Dreadful Sweaters for immediate download! Only $11.95! Click Here to purchase and download now! Have you ever come face-to-face with a genuine monster of the insect and spider world? Did 8-eyed spiders stare at you, unblinking, until you felt like you'd faint? Did you come nose-to-nose with the Clydesdale of the fly world, the one with the spear of a syringe ready to tap your blood? Have you ever seen the Hickory Horned Devil that looks like your worst nightmare of a space-invader? No? Well, then, it's time for you to visit first official bug museum built by and for bugs in the new picture book by J. Patrick Lewis, Face Bug! The Face Bug Museum features the museum story in first-person punny poems by the fourteen featured creatures on display in addition to Fred Siskind's phenomenal, extremely creepy face-photos of each of them. Not to be outdone, Kelly Murphy, the illustrator, adds excitement and fun through comic cartoons of buggy museum visitors that are sure to make you laugh out loud! For the scientific minds who want-to-know, the end notes complete the museum with full-body photographs and detailed information about each featured creature. For classroom connections, the Kids Wings Literature Guide for Face Bug by J. Patrick Lewis will extend the fun, hone reading skills through inquisitive questions, stimulate interaction through discussion, inspire problem-solving in a logic puzzle, use new vocabulary in crossword puzzle, lay the foundation for creativity and figurative language in the form of alliteration, onomatopoeia, rhyming, and hyperbole. You will also answer an curtain call that invites you to draw your favorite museum bug and write a persuasive paragraph detailing reasons why it should be everyone's favorite. Busy teachers love the many pages activities that support and extend Face Bug by J. Patrick Lewis. You can depend on Kids' Wings to prepare your students for standardized testing by stimulating, challenging, and stretching their brains instead of lulling them to sleep with boring, mind-numbing drill-and-kill! The Kids Wings 10-page literature guide is perfect for lesson plans, handouts, or projection on your SmartBoard for Face Bug by J. Patrick Lewis is now available! 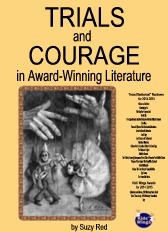 Face Bug and Lester's Dreadful Sweaters are included in the Kids Wings Trials and Courage Collection of literature guides for award-winning novels and intermediate-level picture books all on one convenient CD. Included are 848 pages of activities in 22 titles PLUS 18 "Jeopardy-type" games! You can purchase a literature guide individually for around $12.95, but if you order Trials and Courage Collection, you can get 29 literature guides for only $25, or less than $1 each! This is probably the greatest bargain in the USA, as long as quantities last! This Kids Wings Interdisciplinary Literature Guide is now available.